Caviaroli is fine Spanish olive oil that is encapsulated to mimic the delicate refinement of caviar. The concept transpired back in 2008 when Ferrán Adrià created this innovative product and produced it in small quantities, inspiring others to take part in this surprising enterprise. Pere Castells, technical director of Fundació Alicia, introduced olive oil caviar to the Caviaroli team and helped begin research on production. For two years, the team worked enjoyably at mastering the technology which initially was a challenge. Finally, the first olive oil caviar was created outside of El Bulli’s kitchen, and soon it was presented to Ferràn Adrià, who promptly ordered 10kg in less than a week. Adrià considered this new caviar good enough to be served at El Bulli, the restaurant where he worked as head chef. He even presented the product in a lecture at Harvard, saying that “soon the olive oil caviar will be available,” and in jest added, “…but it can only be done with Spanish olive oil”, encouraging the use of quality grade Spanish products. In 2011 at the Australian Fine Food’s Show, Caviaroli won “Best new Foodservice product award”, and in 2012 the production plant in Spain was registered and Caviaroli was approved by the FDA. Stored in a sleek glass bottle, the Caviar will stay fresh for up to twelve months–the same as regular bottled olive oil. It really enhances the presentation and the eating experience. Best of all, it doesn’t need to be consumed immediately like caviar made with basic spherification, making Caviaroli easy and convenient to use. This olive oil caviar is not made using the traditional method of basic spherification because the sodium alginate cannot be dissolved in oil. It is made using a new technique which surrounds olive oil drops with a thin layer of water with sodium alginate and the drops then go into a calcium bath (basic spherification). Olive oil does not gelatinize, but with this technology, Caviaroli is able to create a thin capsule of gelatin around the olive oil drop to form the olive oil caviar. With this patented method, the olive oil inside the sphere remains pure as it has never been altered by adding an alginate or any other ingredient. 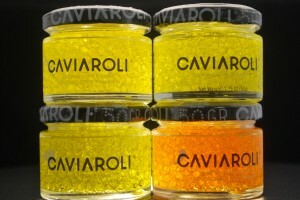 As the olive oil contains no alginate, the process of jellification does not continue after the caviar is formed and Caviaroli can be stored to be consumed at a later time. There are numerous applications of Caviaroli as olive oil pairs well with a wide variety of ingredients. Here are some examples of dishes with olive oil caviar served by Ferran Adria at el Bulli and by other well-known Chefs who are serving Caviaroli. Leave a comment Posted in Wellcome! We are passionate about delivering superior quality, service and choice to our clients and customers: our reputation and the loyalty of our clients and customers depend upon it. The quality and safety of the food and services we provide, and that of our products and processes, is paramount and must never be compromised. We aim to provide a high level of client and customer service at all times.